Terry Hershner proves 3000 on one of the two TTXGP Zero Motorcycles is possible. How did he do it, read on. Terry Hershner has been building electric motorcycles and making his house off the grid, so he knows a thing or two about electric vehicles, EV and alternative energy. In fact, Terry has to face the city of Orlando to explain why he wants out of the coal madness and not be on the grid, something many cities won’t allow. When he found out Zero Motorcycles would unveil its 2013 line of motorcycles in Long Beach, see our original story here: Zero Motorcycles 2013 Double Horsepower And Range, he decided to drive coast to coast. 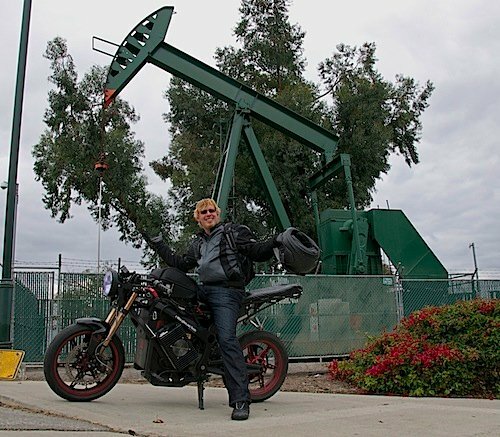 For a look at the technology involved, see: How did Terry Hershner travel 3500+ miles on an electric motorcycle in 6 days? While a modified Zero Motorcycles, he rode over 3,000 on the original sticky race tires. 3,000 On Electricity. When Terry Hershner decided to come to the official Zero Motorcycle unveiling, that was over 3,000 miles from Miami to the other side of our country, Los Angeles. He originally started from Orlando. While he didn’t technically drive coast to coast, we can blame on the lack of charging stations in Texas. It an ironic twist, it wasn’t the motorcycle’s fault and today’s range of 140 miles is more than sufficient for a sea to shining sea trip. The Preparation. Terry drove from Orlando to Miami where he modified his Zero Motorcycles with 4 extra on-board chargers allowing him to jump from 1 kWh to 7.6. This gave him a 95% charge in less than an hour. This gave him more than enough to get to the next charger and tap over 3,000 miles on electrons. I asked Terry what happened when he stopped to recharge. He opens up his laptop, checks his email, does a few trades, recharges his iPhone, eats a bite, walks a little bit and is ready to get back on the bike... refreshed the bike fully charged. In fact, most of the time the bike recharges faster than his lunch. Riding A Zero Motorcycles Z. When we got on the motorcycle, I told Terry I would tap on his shoulder to tell him where to turn. He laughed and said we were on an electric motorcycle and there is no need to shout. Again, you just have to ride an EV to get it. Terry says he can drive 60 miles with his electric Zero Motorcycles keeping a hot cup of coffee in his left hand, something you can’t do on a regular motorcycle. Listening to an mp3 player without blasting the music and using up the battery is easy. More Chargers At Restaurants. Asked about what could make EV trips easier the answer is simple, we need more chargers at restaurants. So how hard is it to recharge an EV? The hardest thing is you need an opposing thumb. Watch the videos below to see. In the meantime, we went to grab a bite that will take longer than it takes to recharge the 40% drain we put on the battery pack. Terry was fascinated when I brought him to see the gigantic oil pumps extracting crude oil in Signal Hill, once known for its oil production. What was so funny about it? Those rigs use efficient electric motors to drive the oil out of the ground. Oh, the irony of it all! Also see fellow writer David Herron's: How did Terry Hershner travel 3500+ miles on an electric motorcycle in 6 days? for a in depth look at the technical aspects of this journey. What can we say about the pioneers who have brought us electric cars and motorcycles, proving us that laptop battery technology and lithium-phosphate goes beyond our wildest imagination? It’s hard to imagine 6 years ago we were debating whether or not EV were here to stay. Stay tuned for more on my interview and meeting with Terry. Today Terry showed us it was almost possible to drive from Orlando to Los Angeles via Miami on a Zero Motorcycles modified Z.